Photo by Zach Forstrom. 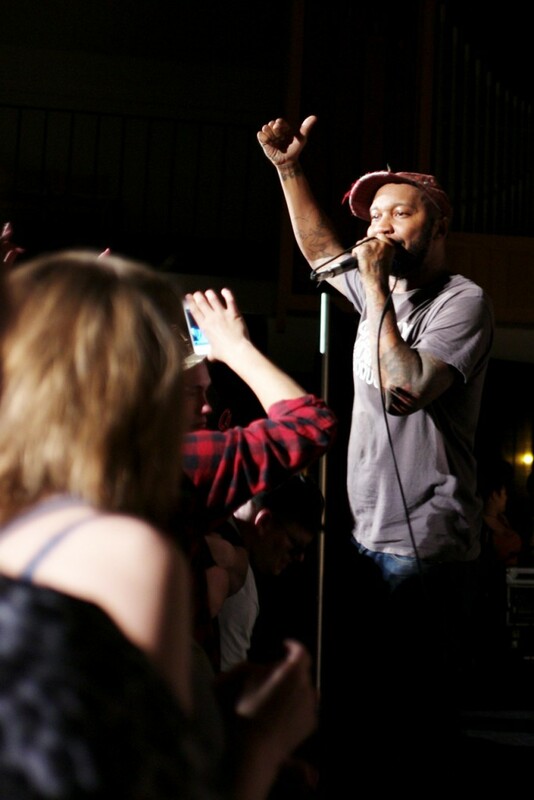 Hip hop artist POS served as the headliner for the evening concert for the Hip Hop Summit on March 31 in the Centrum. Other artists that performed during the concert included Big Mike, Big Rob, Mike WIl, Me and You Crew, Kipp G, Tony the Butcher and Desdamona. The Black Students Union, for one of its maiden events since its inauguration a year ago, took up the mantel of organizing the annual Hip Hop Summit this year. The Hip Hop Summit was previously organized by the Hip Hop Congress, a national committee that has a chapter on campus. Last year, however, the Congress failed to put on the summit. Robin Wisner, president of BSU and former member of the Congress, said he thinks the problem was due to time management. In addition, he explained why the BSU decided to take up the reins this year and associated it with the departure of the Congress’ former president, 2011 graduate Dawit Endale. “The Congress didn’t have a strong hold after his [Endale’s] graduation, so BSU decided to take it on,” Wisner said. The BSU does not take full credit for putting up this year’s summit, however, according to junior treasurer Michael Wilson. “We worked with Intercultural Affairs and Campus Entertainment Commission very diligently to put this together,” he said. The three organizations were instrumental in selecting the group of performers who graced the campus this year. According to Wisner, the three organizations set up a committee responsible for preparing a list of preferred artists. The artists with the highest popularity within the committee were selected. The star studded cast consisted of Big Mike, Big Rob, Mike Wil, Me and You Crew, Kipp G and Tony the Butcher and Desdamona, with artist POS as the headliner. As always, the summit was a day-long affair consisting of various workshops that showcased the elements of hip hop like graffiti, a panel discussion and an evening concert. Unlike previous years, this year’s workshops excluded breakdancing. In its place was the freestyle/spoken workshop overseen by Desdamona, a rapper and spoken word artist from the Twin Cities and Kipp G, an underground rapper, freestyler and graffiti artist from Fargo. “This workshop is cool for interested people to learn from the professionals,” Wisner said about the new workshop. In an era where hip hop has a lot of negative connotations and stereotypes, Wisner and Wilson both had similarly positive views on what the community could learn from these summits. Students in attendance had positive things to say about the day’s events. Freshman Amy Tran, who, like most in attendance, had a relatively basic knowledge or none at all about hip hop, left with a new appreciation. Senior Julie Arnold was impressed with the way the panelists delivered their points. “I liked the distinction they made between mainstream hip hop and underground hip hop,” she said. But even though the day’s events appeared successful to those who attended, one fact was blatantly apparent: the lack of an audience from Concordia. Even though Morrie Jones Conference A/B, where the spoken word workshop and discussion were held, was more than half full, the number of Concordia students in attendance was lacking. Instead, there was a great attendance from staff and students of Circle of Nations in Wahpeton, N.D., who heard about the event online. “They [the children] came to it the last time. They seem to enjoy it,” Melanie Jones, a home living assistant at the school, said about their appearance this year. Desdamona, who saw the audience grow from a meager crowd of less than ten Concordia students to a crowd with about 30 fourth to eighth graders, saw this as an opportunity for Concordia to team with other schools for the summit. Concordia students in attendance, on the other hand, were not particularly pleased with the lack of support from students. The evening’s performances seemed to be taking the same route as the day’s events, with just a few students partying with the performers in the Centrum. But just when it seemed like the 200 confirmed people on the Hip Hop Summit Facebook page appeared to be some sort of a fluke, things turned around for the better. Wisner and Wilson transformed into their alter egos Big Rob and Mike Wil, and they were instrumental in drawing a more sizeable crowd with their performance. Desdamona, who spoke about the difficulties women face in the hip hop industry during the panel discussion, had no problems drawing in the largest crowd to the Centrum, which was packed with dancing students by the end of her performance. She has been organizing the B-Girl-Be summit in Minneapolis, a conference which seeks to encourage girls to be more prominent in the hip hop world. She had nothing but positive feedback about the summit at the end of the night. “There is so much potential for this show. It could get bigger and bigger each year,” she said. She also sees the summit growing into a big event in the Fargo-Moorhead community, with not only workshops and performances but also with a mixture with films and forums. As an organizer for this event, I want to say that this day was a complete success! This story downplays the most important thing to take away from the show, not the attendance, but the caliber of the Hip Hop concert. And it was the most fun I’ve had at Concordia! The numbers will follow if we make it worthwhile.